Today, Ade Namnung, a local presenter and comedian, passed away. I don’t know him personally, but his face is so familiar it didn’t take long for me to recognize him as soon as I typed his name into Google Image search column. One of my friends, Fajar, was diagnosed with HIV several years ago. He’s about the same age as Namnung, I think. He never spills his real age. 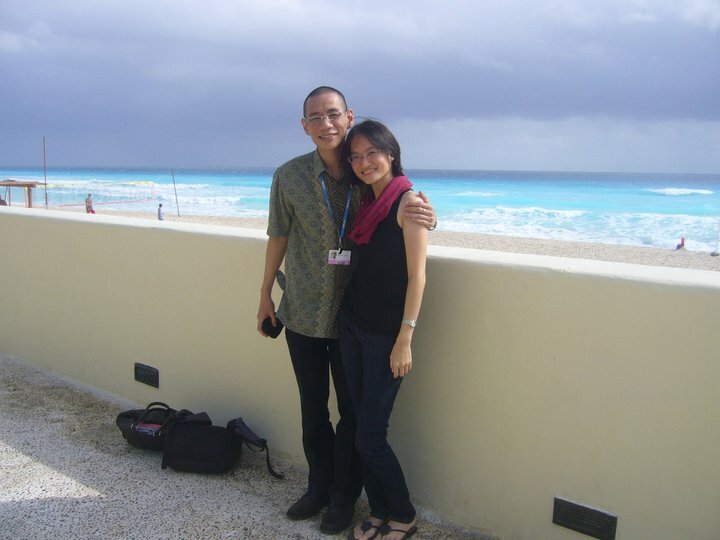 I worked with Fajar for a year and we traveled together to Cancun, Mexico, for 2 weeks. As we got closer, I observed his life and couldn’t be more touched. Fajar and I became great friends after the trip. I admire Fajar. Everything about him. His love towards his wife and 3 adorable kids. His persistence. His bravery. Never before I met someone like him. He could have given up, but he decided to fight. And he’s not ashamed of his situation. He’s always open, honest and never holds back. I’ve learned so much from Fajar. But there’s one thing that keeps bugging me. The fact that he could leave this world anytime, at such young age. He could fall into sleep and never wake up again. Still, with the knowledge of what might happen to him, he refuses to give up. He decides to keep on living. To keep on fighting. And I adore him even more for that. The death of people at young ages always remind me of Fajar. Today, I am once again reminded. But every time I remember him, another awareness raises to the surface. It could have been him. But it also could have been me. It could have been you. It could have been one of us who go to sleep and never wake up again. Because the truth is, we never know. Fajar was diagnosed with HIV. Namnung was diagnosed with stroke. But what difference does it make if death can happen anytime, to anyone? Today, I had a brief chat with Fajar whose daughter, Immi, is celebrating her birthday. I promised the little girl I will come to their place and play with her. And I will. A promise is a promise. But the most important promise is the one I make to myself: that I will appreciate life more, constantly and continuously, and I will see my beloved friend again, whose hard works and fights have taught me that life is too precious to be wasted. Death and Life. In that order. Because many times, death brings us closer to life than we’ve ever known. Fajar and I – Cancun, 2010. I lost a dear friend of mine, Freddy Malik, to HIV related illness. He was only 28. He was a fighter, through and through. He changed my prejudice towards people living with HIV/AIDS, actually made me more sensitive towards other people being prejudiced and persecuted for things that they can’t change themselves, for who they are and which family they were born to. His death was poignant reminder that life is about fighting the injustice and amending our past faults, making sure that we become a better person everyday and never losing hope in the fight. nice writing. this one is my fav in ur blog. u’re right that death can come upon us anytime. my parents went to bed and didnt wake up too. i hope u keep that promise to the little girl. kids always remember a promise. my dad made a promise to me once. a promise he couldnt keep bcoz he died at the same day. and i still remember that little promise until now. feeling hurt each time i remember.